Art for walls does not necessarily have to be in the form of paintings. There is no written rule in the home décor book that says you can’t have heartwarming and inspirational quotes on your walls. 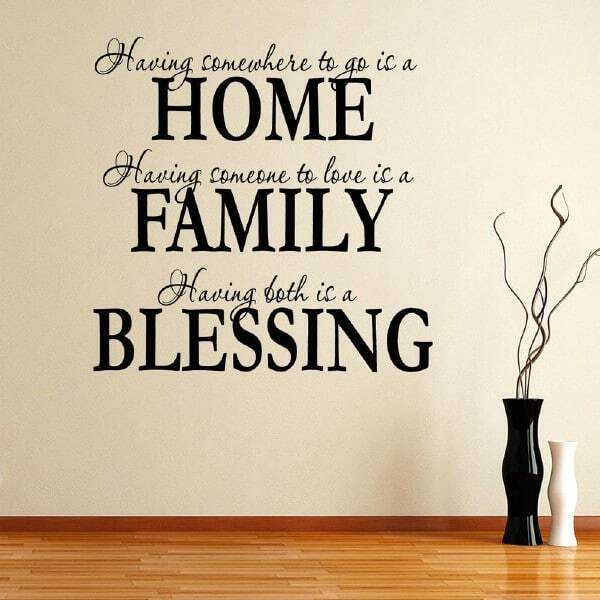 In fact, if you are looking to customize your wall art, wall quote decals are the perfect way to do so. We have a nice post on how to DIY Wall Stencils and Decals if you decide to do them yourself. Wall quotes are fun and trendy and give you the opportunity to say what you want to say so that everyone who enters your home will see your personal message of inspiration. There are a number of vinyl wall quote accents on the market that are very easy to use and look like they have been hand painted. The difference is that they take much less time to apply and do not cause a mess like painting does. 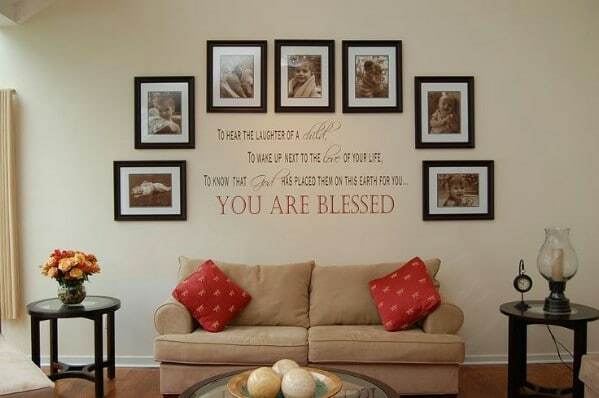 You can choose different sayings for different rooms and add a touch of personalization all over your home. What better way to spread a bit of hope and inspiration than by reminding people that they are truly blessed? This is a beautiful saying and these decals come in different color choices. This is a great piece for the living room wall or would make wonderful nursery décor. Add a few favorite photos around the saying and you can really dress up your walls. If you want to show everyone that you are truly blessed by your home and family, these decals are a great way to do that. There are a number of choices and they are relatively inexpensive so you can choose more than one and still decorate your walls pretty cheaply. 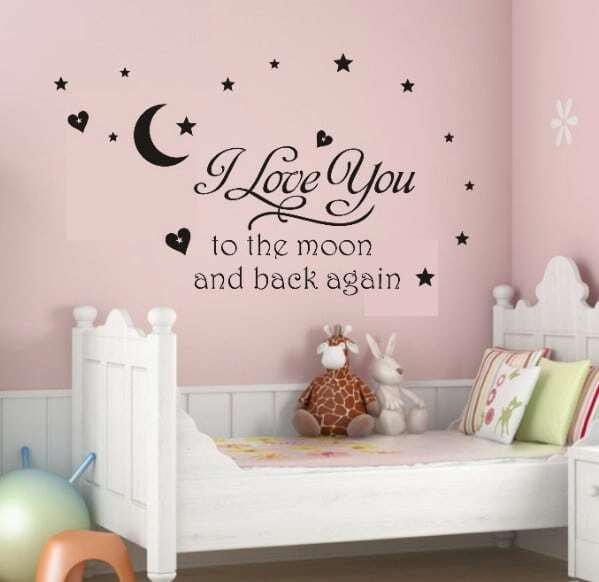 If you are decorating a nursery, the “I love you to the moon and back” decal is a great choice. It comes in different colors, even pink for little girls, and is a beautiful saying for any wall. The hearts, stars and moon shapes make it perfect for babies and toddler’s rooms and the decals are very easy to apply. This is a beautiful saying for any nursery. It speaks of the love between a couple and how their love is complete now that baby has arrived. The decals come in a number of color choices so they are really easy to match up to any existing décor and there are 2 size choices that make it perfect for smaller rooms. Family sayings are very heartwarming. 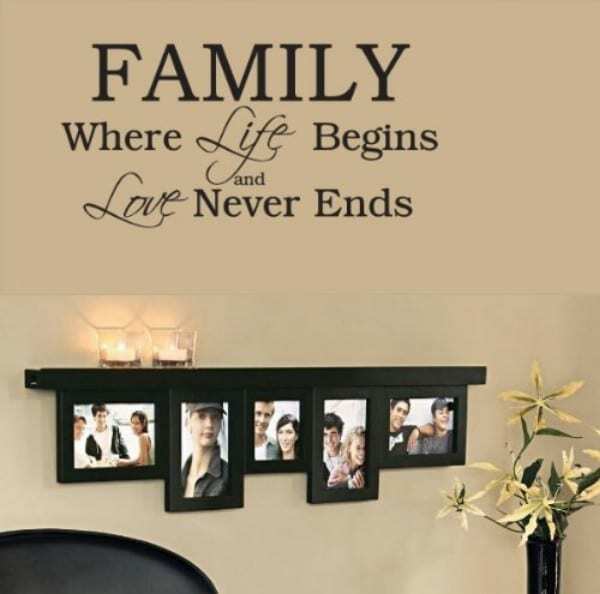 They are perfect for decorating dining rooms or living rooms and you can surround them with pictures of family members to make the entire wall look like a dedication to the family that you love. Vinyl decals are also easy to remove so you can move them from room to room if you want without worries of stripping paint from the walls. The “kiss me” sayings are perfect for the master bedroom. These make wonderful wedding gifts and any newly married couple will love decorating their new home with them. They look great above the bed or just anywhere on the wall. “Always Kiss Me Goodnight” goes right along with the “never go to bed angry” lesson that all married couples have been taught. 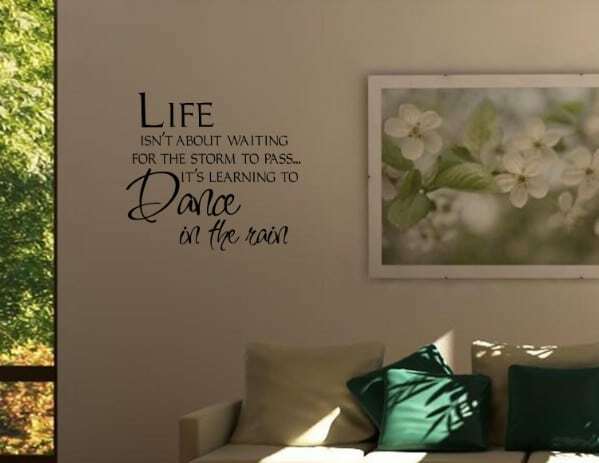 What a beautiful saying – Dance in the Rain is a very inspirational message that you will be proud to have on your wall. After all, life really isn’t about the storm. It is about learning how to dance in the rain. This beautifully inspirational saying is perfect for any home, particularly those that have gone through hard times and come out ahead. 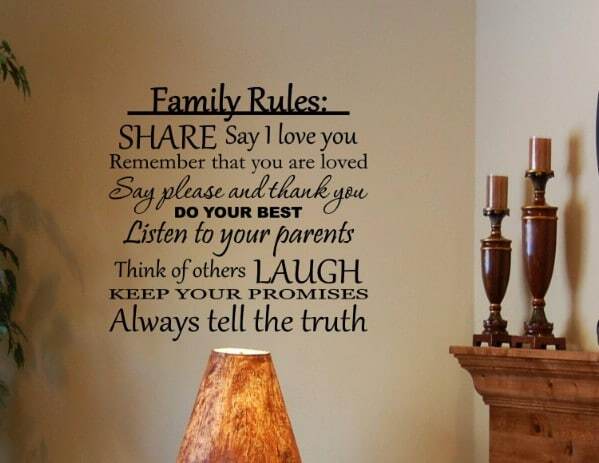 You can find family rules signs that hang on the wall but what better way to show your love and support for each other than to have it written on the wall itself? This family rules decal is something that your children can come to love through the years. They will be reminded of their wonderful childhood each time they see the saying on your wall. 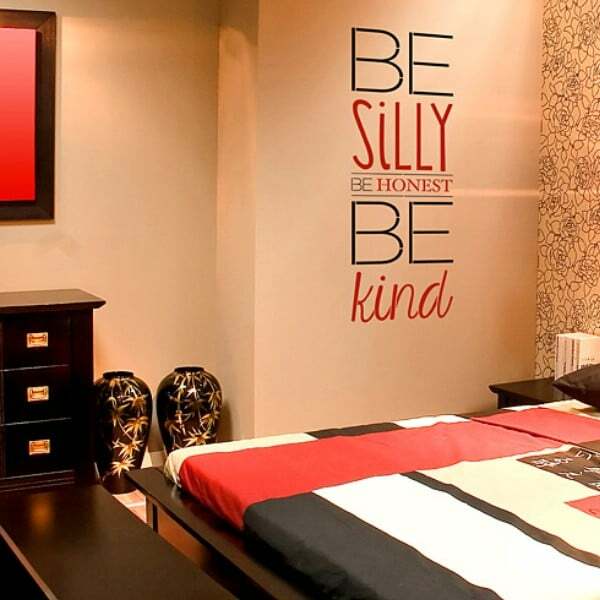 Be Silly, Be Honest, Be Kind – This is the perfect wall quote for any teenager’s room. The lettering is perfect for younger children as well. Big bold letters deliver this wonderful message that is sure to spark a smile in your child each morning when he wakes up and sees his inspirational message. What a great saying for a bathroom or bedroom wall! Being yourself is important and this saying will remind you or anyone in your home to always be yourself. This inspiration can greet you in the bathroom mirror every morning and brighten your day before it even begins. It is also a great choice for teenage girls’ rooms. This is the perfect wall quote for every bedroom in your home. Whether you are decorating your master bedroom, kids’ rooms or nursery, telling them to have Sweet Dreams every night is a lovely sentiment. The saying is perfect for baby’s rooms and will look great surrounded by your family photos. Whether you are looking for quotes for a kid’s room, teenager’s room or you want something in your main living area to inspire guests, there are many options that you can choose. Wall art decals are inexpensive and so easy to use that you may find yourself adding one to every room in your home. 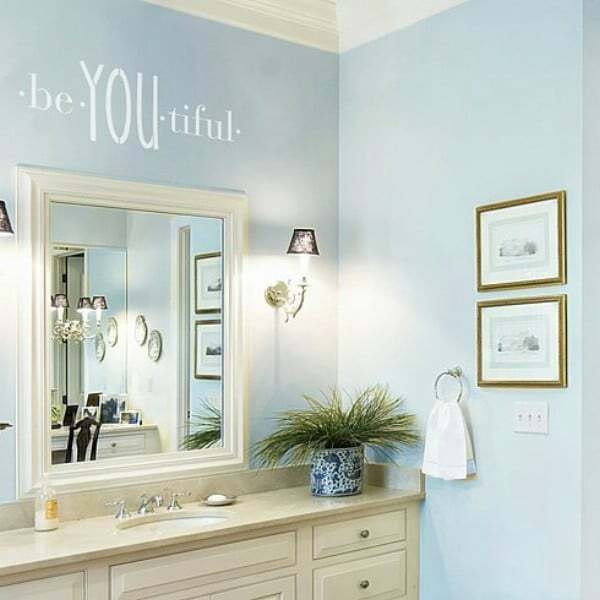 Décor quotes are a trend that is growing quickly and we have compiled a collection of beautiful and heartwarming sayings that you can choose to inspire those who live in and visit your home.